Well, I have discovered that I am not a fan of…whatever this book is! Considering the labyrinth of mystery in Bury Me, I have tried not to add any spoilers. Just be aware that there may be slight nudges that could give you an idea of what unfolded in this story. 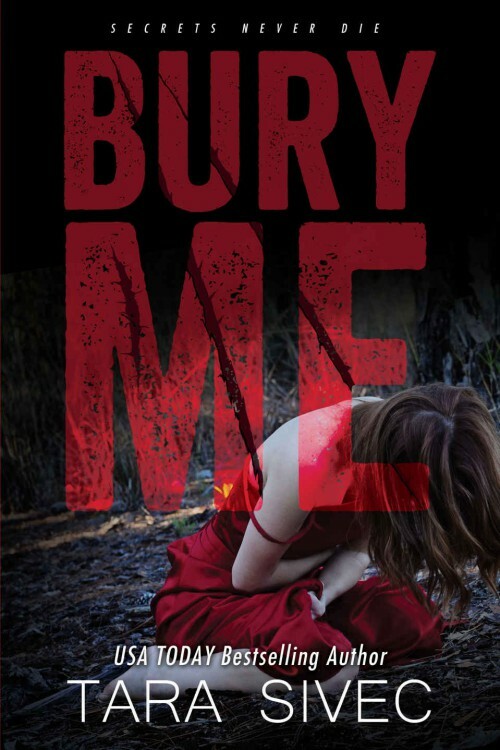 When I came across Bury Me I was so thoroughly intrigued that I snapped it up, right then and there. With a captivating riddle for a blurb I was eager to find out what had happened to this poor girl. My mind immediately started filling in possible scenarios. Eager to gobble this story right up off its pages. However, I am a romantic at heart. Unfortunately I eventually realized that above all else, Bury Me is not a romance. Let me clarify that my low rating on this review is not based on Tara Sivecs ability to wrap her reader in a cloud of mystery. Tara Sivec uses words to stitch a story so compelling that even though I had no flippin’ clue what was going on, I still couldn’t put it down. Bury Me was a Rubix Cube until I was hand fed the answers. No. My low rating is purely selfish. It is solely based on how the story made me feel as I worked my way from cover to cover. So, that is what I am going to focus on here, how I felt throughout Bury Me. Because I felt a whole hellova lot. From the very first page of Bury Me I was confused and curious. My mind cooked up several plausible and very possible theories – all of which were proving wrong. So I fed my curiosity, and I kept reading through the confusion. Confusion and Curiosity was quickly burnt out by frustration and curiosity. Just who is this girl? I have never encountered a character like Ravenna before. Why are her thoughts and inner monologue so… extreme? Ravenna wasn’t reacting nor behaving the way I expected – or wanted. So frustration stepped in.. I was trying to build a character in my head, but all the pieces were creating something very, very dark. Something I wasn’t sure I could like. But forever the optimist that I am, I persevered. No matter how much I was growing to dislike Ravenna, a part of me was holding onto that last shred of hope. With everything it had. Because that last little bit of hope? Totally, completely convinced, that somehow a happy ending would form. Closing in on the end of the book, growing angry and still completely confused by Ravenna’s reactions and thoughts. I started yet again to doubt myself, I questioned everything that I thought I had figured out. Seriously, my brain just does not function the same way as Ravenna’s (thankfully) so I found it very difficult to understand why she is like she is. Nevertheless, I was full throttle at that point and eagerly barreling towards the climax. Finally! I was so ready for the answers. This is the part where I tell you to read on with caution, for fear of possible clues to what happens in the end of this book. Move over anger, I’m eager now! I am getting the goods. I will collect all the words. This. Was. It. Throughout a setting which builds gradually, Ravenna finds what it was she was searching for. The scene then escalates rapidly and Ravenna is sent swirling down a drain of her own memories. The moment that she has some clarity and awakens to the events that have unfolded, that were hidden in her memory, she… HAH! I’m not telling you. You have to read the book. Bury Me in its entirety builds up to that one moment. Gotta say… I was expecting…. more?… or different?… or just not… that. My problem you see, is that the book ends immediately after this climatic scene. BAM! Over. I needed those two answers for my sanity, more than any of the rest! Thankfully Bury Me concludes with a lengthy epilogue. After the big climax, the epilogue gave me a full picture of what happened in the book, and the characters lives; Their beginning, throughout and after. It was not what I was expecting. But then again, none of this book was. I have to be honest. I hated the epilogue. It ruined the book for me. After reading it I was left with a resounding anger towards…well, everything! After the big scene at the end of the book, the epilogue is twisted. It tells a story that is equal parts ridiculous, unnecessary, and just plain unbelievable. Not to mention the shameless message that rang out loud and clear; that children born from evil, are evil just the same. The epilogue felt like a physical blow. I was winded and angry. To me – for me – it was unjust. But I did get my two answers and I closed the book. Then I just sat, wondering what the hell just happened. I was -still- angry. That unfortunately is the last feeling I walked away with after reading Bury Me. It smothered all the other feels. It was a feeling unlike anything I had experienced in any of the books I have read. So yes two stars, purely for Tara Sivecs epic ability to write so well. I know I’m one of few who didn’t enjoy this book, I can understand that. Ravenna is skillfully crafted, and chillingly captivating. While the other characters I found weak, but likable – they made for a good comparison of just what was growing inside Ravenna, with every memory she gained back, and every instinct she followed. The story itself was gripping and suspenseful – if your into that kind of thing – So, yeah. Had it ended differently, I may have liked it more. But it pushed so hard against everything that makes me, me.. I just couldn’t like it. But don’t hold back. This is just my small view. If you enjoy dark mysteries that are crafted so that even when the veil is lifted, and the story line turns out to be somewhat… predictable… you still didn’t see it coming.